Why would two prehistoric cultures thousands of miles apart and which were never in contact make almost identical clay figurines? And why do they resonate with us thousands of years later? These are just two of the fascinating questions unearthed, an exhibition at the Sainsbury Centre for Visual Arts at Norwich University, attempts to answer. The exhibition features clay figures from Japan and the Balkans, in particular Romania but also Albania and Macedonia. The Japanese figurine-makers came from the Jomon culture which flourished from about 16,000 to 2,000 years ago, although the bulk of the Japanese exhibits date from 5,000 years ago or less. The Balkan figurines date from slightly earlier but both display remarkable similarities for such disparate peoples. The Jomon were settling down for the first time, living in huts and villages so that was also leading to a change in their relationship with each other as a form of early society was created. They were also beginning to use pottery and experimenting with ceramic technology, making figurines of fired clay. But they were still hunting, gathering and fishing in order to live. The inhabitants of the Neolithic Balkans were also establishing villages but were beginning to farm, raising cattle, sheep and goats and cultivating a limited number of grain crops. Dr Andrew Cochrane, project curator of unearthed, says: “Throughout the world, some people, for multiple reasons, have used small-scale representations of the human form as a means of displaying their identity, of showing who they themselves were. 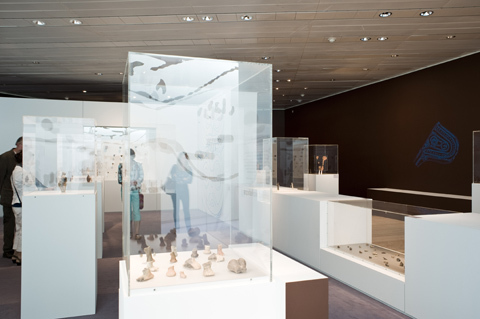 To this end, the early part of the exhibition contains few prehistoric figurines but instead presents the visitor with a number of more contemporary objects in an attempt to give the viewer a feeling for the power of the miniature and set a receptive mood for understanding the Neolithic versions to come. So here we find Lego figures, an animation of figurines from Sarah Beare and a photo of Frida Kahlo showing the great Mexican artist holding a small Olmeca figure. There is even the doll which inspired Barbie, Bild-Lilli, who featured in a 1950s cartoon strip in the German tabloid. But perhaps the most curious exhibit in this part of the show features two Hina dolls from 20th century Japan. A gift to Lady Sainsbury, she passed them on to the Institute for the Study of Japanese Arts and Cultures in Norwich and they make for a strange and somewhat unsettling exhibit. 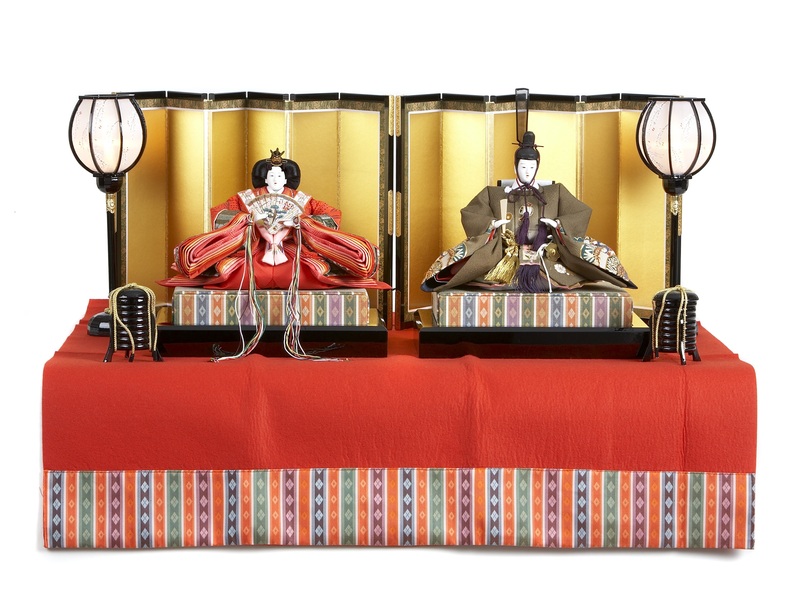 “There are two china figures, a man and a woman in traditional court dress of the 17th century, early Edo period,” says Andrew. “The figures can be added to to make a complete scene. If a couple have a baby girl, a member of the extended family buys this as a present for the child for good luck. And on 3rd March every year you’re obligated to portray the Hina in a prominent place in your home for about three days and then you put them away again. The longer you have them, the more power they gain, because of their interactions with human beings, their owners. Or so the tradition goes. “A recent study in Japan has shown that a lot of people find them quite scary. There’s a sense that they’re looking at you permanently and that maybe their hair grows and other physical changes take place. Even at the Sainsbury institute itself, where they are kept, some technicians are uncomfortable handling them, feeling that they are being watched. From the modern section, the corridor descends to the underground room where the most ancient figurines are displayed, but the contemporary display has prepared the visitor for the prehistoric figures: not so much shock of the new as no shock of the old. The visitor has already been given a figurine of their own to keep or, as many do, break into pieces and deposit in a case in this main area. What’s the point of this? Andrew explains. “When the early figurines were made, they were made to be held. People in the Neolithic Balkans and the Jomon wouldn’t have worn glasses, wouldn’t have had electric lighting so they would have experienced these objects in a very different way to how we do now in full light in a modern art gallery. Touch would have been important and you can just imagine tribal members passing these objects around as objects of veneration or simply as an early expression of artistic form. Some Neolithic figurines are identifiably male or female. Others do not look human at all. In prehistoric Japan and the Balkans, people were experimenting with new ways of identifying themselves as humans and figurines played an important role in how these pioneering villagers experienced the world and expressed their place in it. But even today there are more questions than answers. Archaeologists have no certain knowledge of the exact purpose of the small figures. Many, especially from the Balkans, are clearly female, so did they represent a mother goddess or fertility rites? Were they offerings to the gods or gifts to fellow villagers? How did they feel to the touch all those thousands of years ago when people were struggling to comprehend their world, and do they feel any different now when we may know so much more but perhaps experience the world in a less immediate way? There is also a lot of evidence from both Japan and the Balkans for vast numbers of the figurines having been deliberately broken. “We’ve got evidence for some being broken and the pieces separated by up to 200 metres,” says Andrew. “We fit them together and they’re obviously the same piece. Maybe the idea was you break a figurine, give the other piece to somebody and that somehow links the two of you in some kind of pact or friendship ritual. That might explain the distance between some of the remains. But not all figures were broken and some were designed as solid vessels to hold liquids or to be used as censers for spreading smells and smoke. Everyone who visits the exhibition will have their favourite piece and here I reproduce mine. He or she seems to be a shrouded figure from 5500-3500 BC in what is now Romania. It seems mysterious and yet you want to reach out and handle it because of its streamlined shape and symmetrical lines. 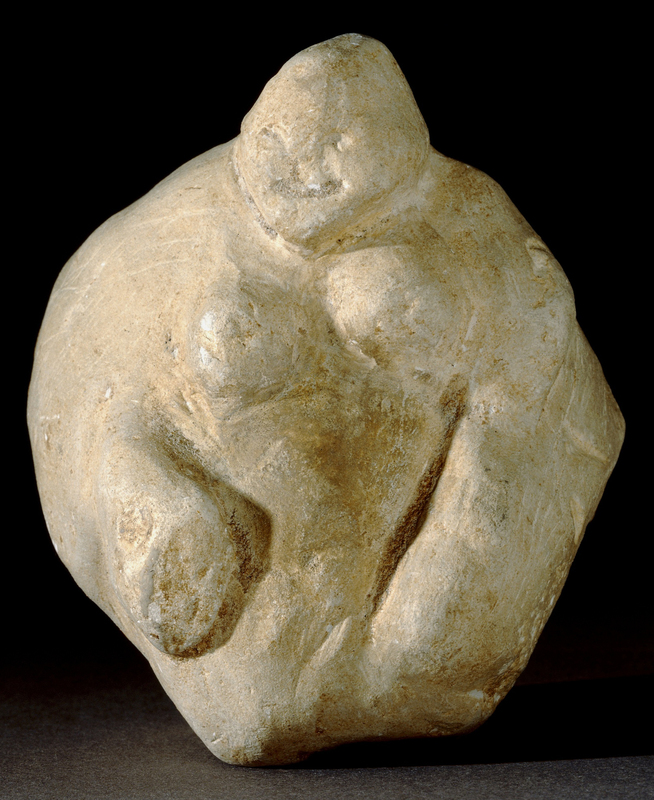 I could not attempt to make such an object now, yet here was a Neolithic man or woman displaying artistic sensibility in prehistoric times. And what of our own island? Where are our figurines? Virtually nowhere if truth be told, as Andrew explains. Curiously labelled ‘A chalk figurine from the Neolithic/modern culture’, the object was found at Grime’s Graves in Norfolk. 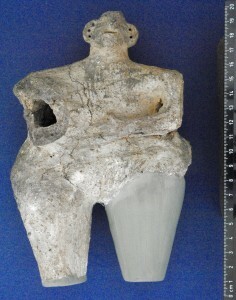 Normally held in the British Museum, this is the first time it has come back to the county since it was found in 1939. A L Armstrong was the principal site archaeologist credited with discovering the figurine. However, the find was accompanied by an extraordinary sequence of events. The day of the discovery he suddenly stopped writing his regular site diary, all other site recordings ceased and he ordered the other excavators off site. This was very odd. Andrew takes up the story: “He had been excavating Grime’s Graves for years and when you make a big find like this you normally increase the site activity, not halt it. “His fiancée at the time was an accomplished chalk carver. She would spend her days in their car with bits of flint and chalk, carving away. He asked her repeatedly to stop doing this but eventually she made an identical replica of this figurine which horrified him so much he called off their wedding. There is still no accurate scientific method of dating chalk such as this but whether it is Neolithic or modern, this small figure had the power to break up a relationship and bring an end to an important dig. And it is not the only object in the exhibition with a modern tale to tell. There is a fragmented figure dating from 4500-3500 BC of the Gulmelnitsa culture of ancient Romania. 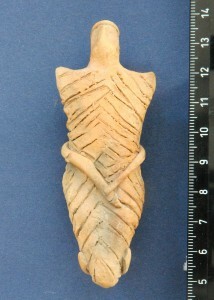 The figurine of fired clay could be male or female but has a protuberance on its back which suggests the latter. It is all that remains of a partner figure to the right and it is clearly a human hand, resting in support or comfort, just as any human might do today to a friend or partner. The ‘female’ figure’s left leg is also missing, presumably lost when the other figure disappeared. Ultimately, the ancient figurines may have been an attempt by early man to control and therefore make sense of a strange and difficult world. By miniaturising the human form, its power is concentrated but can literally be held in the hand, so somehow controllable. Even today, small figures may enthral or appal, but there is no denying their fascination, as the exhibition clearly shows.